Now, as cool as this battery is, it does require some ssh work. The mod is packaged incorrectly so when you activate it via WinterBoard… nothing happens. In order to get the mod to work you will need to ssh into the /Library/Themes/MatteBattery folder. Here you will see a folder and a file… both are titled com.apple.springboard. The problem is that these need to be in a folder titled Bundles. So, in the /Library/Themes/MatteBattery folder, you will need to create a new folder titled Bundles. Then drag both the com.apple.springboard folder and the file into your newly created Bundles folder. Respring your device and the battery mod will work correctly. You can get Matte Battery via the modmyi source. What part of the status bar are you looking to mod? The battery percentage in the status bar is a feature of SBSettings. If you go into More/Extras & Options on SBSettings, you can turn on the Numeric Battery option. I also like to turn on the Statusbar Date option (totally personal preference). 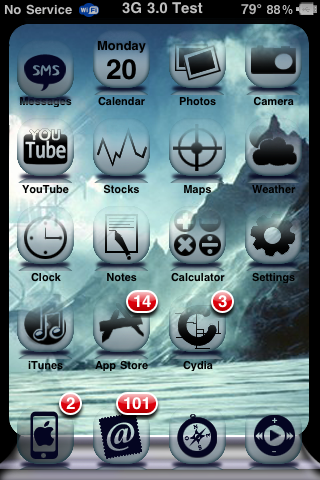 If you are looking to get your weather info in the status bar, you will need to install WeatherIcon mod via the ModMyi source. Once installed, go into your stock Settings application and find Weather Icon. You will want to turn on the Status Bar Image and the Status Bar Temp options. You will also have to have a Weather Icon image package installed from Cydia for the Status Bar Image to display in the status bar… I use Katra-based Weather Icons via the david.ashman.com source. Hope that helps. Let me know if any of that does not make sense. the ones u had in ur previous theme, with the wi-fi written..
What’s the name of that sliver slider in the screenshots? I cant find it anywhere. If you have a link that’d be great.